The present invention relates to a hair brush. More particularly, the present invention relates to a brush for holding at least one of a fluid dispensing device and other items. 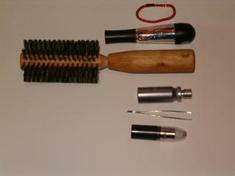 Any appropriate type of item or material could be stored in the cavity designed inside the handle/head of the hair brush. Examples: Small bottle containing water, perfume, shampoo, cream, etc… solid items such as medicine pills etc., or Lady’s accessories such as lipstick, nail polish, scissors etc. I guess you missed the point. Just ask your girl friend to learn how glad she will be to carry all her small female accessories (lipstick, scissors etc) in one place....and not just thrown in the purse. This is very useful tool that can not only hold your important items but also be in your most important female product: the hair brush. Buy one product and get one free! I'm a girl ( not the same who wrote above) and I'm sorry to say that I don't think this idea is innovative or even attractive to women. I think you would be better off inventing some sort of purse or purse division that holds these items intelligently than inventing a hole in a brush. After all, the brush will only hold 1 important item and will have to go in a purse anyway. What's so amazing about this brush? Also, it would be kinda gross to throw my pills in there. All you invented was a tube that can have things thrown in. I think this innovation is great to contain those small bands and tiny clips or even pins. I can understand why some women are grossed out with the idea of stuffing their pills or any medicines in there. However, I think this will work with smaller hair accessories like pins and small bands (obviously NOT scrunchies) and clips.